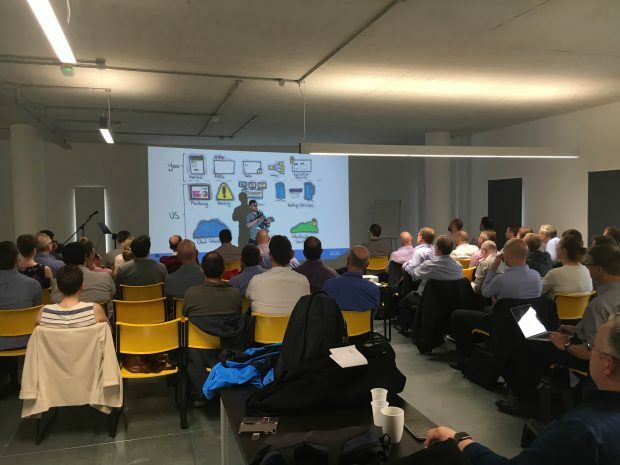 We recently hosted a GDS platform as a service (PaaS)/Cloud Foundry event at TechHub in Swansea. Representatives from organisations as diverse as DVLA, Met Office, Driver & Vehicle Standards Agency, Office of National Statistics, Intellectual Property Office and Companies House supported the event to find out more. Although this was billed as an event about Cloud Foundry and the Government Digital Service (GDS) PaaS service, it was actually much more than that. It was a gathering of many people from many departments to look at an offering from GDS that may help ease something we’re all facing – deploying to the cloud. Shortening this loop to gain faster feedback is something we already do when we write code. We write tests that are run whenever we change things. We automate those tests so that they can keep an eye on our code when others apply their changes. We get fast feedback from these tests and correct them if broken. And we’re happy developers! Everything is working, great job! Not so fast. What about our users? These are the people that actually matter in this whole exercise. So we deploy, or at least we attempt to deploy. If you're lucky enough to have a great team of people this will be well automated and should be a painless experience. Then your customers will be up and running within minutes! We get feedback, we act on that feedback and we deploy! Brilliant. How many of us are actually in that happy place? We need to shorten the feedback loop! So when Rory Hanratty, one of the product managers for PaaS, took us through their service, it offered us some hope and presented what is possible. Yes it all looks very simple. We know that in reality a lot of work needs to be done before the one command deploy happens, but this takes care of a bunch of stuff for us. It looks after monitoring, alerting, log aggregation, high availability, cloud infrastructure, infrastructure security, data stores and other backing services. It’s built on top of Cloud Foundry, which gives us the speed, simplicity and control we need to develop and deploy applications faster and easier. Will it be able to cope with those of us that have complex legacy integration requirements? Not at this stage. What about sensitive data? Not just yet. Will these things come? If they listen to the feedback from customers, absolutely – why not? Will they listen? It certainly looks that way.